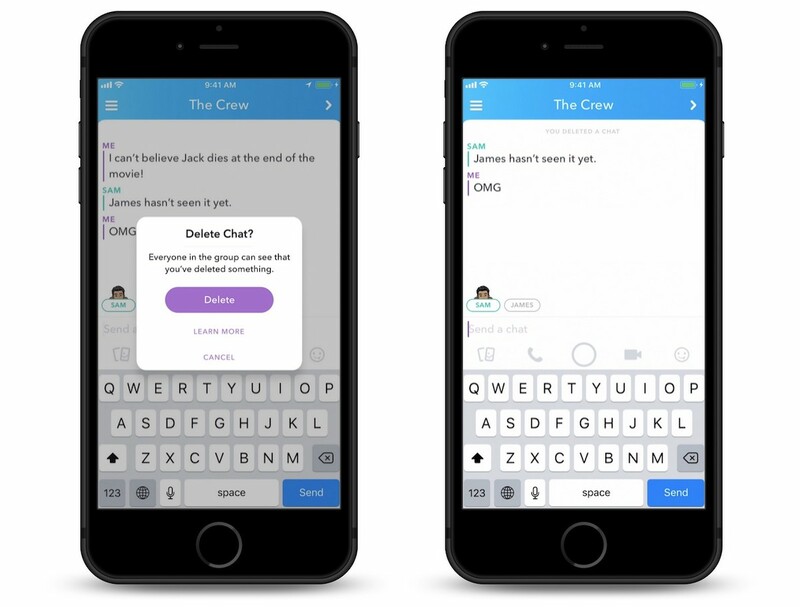 Snapchat today announced a new feature called "Clear Chats," which lets you delete any message you've sent to another person on Snapchat, whether in individual or group chat. This encompasses text chats, stickers, audio and voice notes, and any photo and video snaps sent from Memories. To delete a chat message you can press and hold on the message or media in question and select the new "Delete" option. Snapchat warns that after this the recipient will be alerted in the conversation that a message was deleted. Anyone can still screenshot message contents as well. Clear Chat will not be affected by direct snaps, however, so if you open Snapchat, take a picture with the camera, and send it to someone, the snap will not be deletable. Instead, any photo or video snap sent from Memories (swiping up on the camera screen) can now be deleted after it's been sent, in addition to basic text deleting options. Additionally, the social media company is today launching the second generation Spectacles on Amazon in the United States, United Kingdom, and Canada, after first being available only on Snapchat.com. In the coming weeks, Amazon storefronts in France, Germany, Italy, and Spain will also gain Spectacles 2.0. On Amazon, Spectacles will be available in Onyx Moonlight, Sapphire Twilight, and Ruby Daybreak, and the glasses will run for $150 in the United States. Snapchat chose to launch the new Spectacles only on its own website at first in a bid to ensure that supply and demand was more balanced this time around, and now the company is prepared for a wider rollout. Message deleting will roll out to Snapchat users across the world over the next few weeks. So now you can post insults, delete them and deny everything? Not sure I've ever thought I needed this, but I guess it's nice to have nonetheless. No. If you read the article, it clearly says "Anyone can still screenshot message contents as well." Plausible deniability cannot be ensured. When you send that naked picture and then have second thoughts.